Coyotes can adjust their daily activity patterns in order to avoid humans. This usually means that in urban landscapes coyotes are most active at night or in the early morning hours. Resident coyotes occupy and maintain exclusive access to territories by scent marking, vocalizing, and physically excluding intruders. The territory is home to a male-female pair and their young offspring. Some older progeny might remain with their parents beyond the first year, but coyotes are not known to form large multi-family social groups or packs. 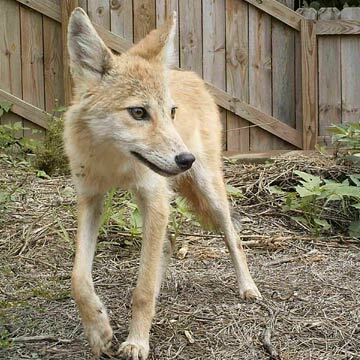 Therefore, all coyotes within a particular territory should theoretically be related to one another. The size of the territory is determined by how easily the coyotes’ needs – reliable food, water, shelter, protection from persecution, ease of mobility, suitable den site – are met. Therefore, coyote territories can vary widely in size. Transient coyotes are those that are looking for a territory, ready to take over when residents move (or more likely are moved) out. Vocalizations (howling/yipping/barking), which are frequently heard at certain times of year, allow coyotes to communicate with one another. The message might be one of romance between a male and female, or it might be telling other coyotes to stay away. Hearing these sounds is nothing to be alarmed about. Here is a great example of coyote group yip-howl, which was caught on the Berry College eagle cam in January of 2015. Notice that the group appears to be vocalizing in response to coyotes off in the distance (listen carefully for the faint sounds of the other group). This is likely a situation where two separate groups are announcing their own territory to one another. The vocalizations act like an auditory fence. This is also an example of the “beau geste” effect. Several vocalizing coyotes in the foreground (probably a family group of a mated male-female pair and one or two of their offspring from the previous year) are giving the illusion that the pack is much larger in numbers. The rapidly fluctuating pitch and frequencies of the barks, yips, and howls reverberate and scatter throughout the environment and become distorted. What is in fact just a few coyotes sounds like many more. This auditory trick works on both humans and other coyotes. Also notice that the video clip actually spans a 60+ minute time frame, so the sounds come from farther away as the coyote family likely moves across its territory.